Characterized by versatile imaging specs, the Canon EOS 80d further clarifies itself using a pair of robust focusing systems and an intuitive design. Featuring a 24.2mp APS-C CMOS sensor and Digic 6 image processor, this sleek DSLR is capable of capturing high-resolution images at up to 7 fps and full HD 1080p60 video, both with reduced noise and high sensitivity up to an expanded ISO 25600 for working in difficult lighting conditions. When working with the optical viewfinder, an apt 45-point all cross-type AF system AFfords fast performance in a range of lighting conditions for tracking moving subjects and working in low light, while the dual pixel CMOS AF system benEFits live view shooting and movie recording by providing a smooth, natural focusing quality akin to the way a camcorder acquires focus. Touch-to-focus is availed by the large 3.0" 1.04m-dot touchscreen LCD, which also sports a swiveling vari-angle design for working from high and low angles with ease. Additionally, built-in Wi-Fi with nfc allows you to pair mobile devices with the camera to wirelessly transfer files for sharing your photos and movies online. 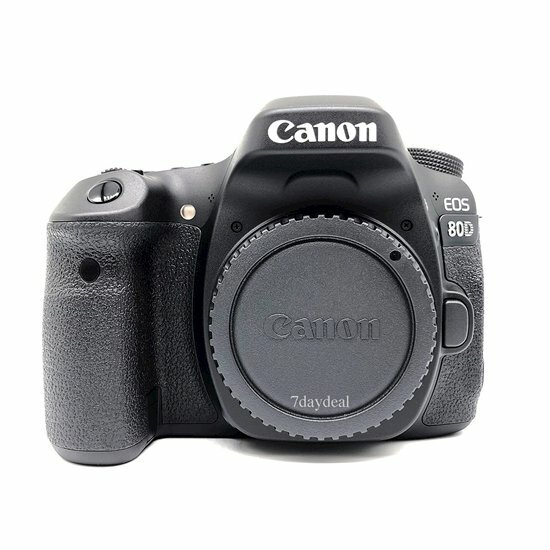 More than just a well-connected DSLR, the 80d is equally matched in imaging versatility due to its inclusion of multimedia feature-sets for stills shooting and movie recording. Featuring a 24.2mp APS-C CMOS sensor and Digic 6 image processor, the 80d is capable of producing high-resolution imagery with notable clarity and minimal noise, as well as a native sensitivity range of ISO 100-16000 that can be further expanded to ISO 25600 to support working in low-light situations. The sensor and processor combination also avails fast performance throughout the camera system, including the ability to shoot continuously at up to 7 fps or record full HD 1080p video at 60 fps in the mp4 format. BenEFitting stills shooting with the optical viewfinder, a wide-area 45-point all cross-type phase-detection autofocus system provides quick and precise focusing in difficult lighting conditions down to -3 ev. For working with telephoto lenses fitted with extenders, 27 of the points are capable of focusing down to f/8 and the center dual cross-type offers increased precision at brighter aperture values. The cross-type design of the sensors AFfords greater accuracy in low-contrast and mixed lighting conditions, and the broad coverage of the 45 sensors is ideal for tracking and maintaining focus on moving subjects. Making use of the 45-points is a series of four AF area selection modes, including single-point AF; zone AF, where you can select from one of nine AF zones; large zone AF, which offers a choice of three selectable zones; and 45-point AF auto selection, which allows the camera to select a single point automatically. When recording video or shooting in live view, a dual pixel CMOS AF system is employed that offers smooth and fast focusing performance in a similar manner to how a camcorder acquires focus. This system integrates two separate photodiodes within each pixel to provide a broad and dense network of phase-detection gathering elements across a majority of the image sensor to reduce focus hunting for faster, more direct control of focus placement. When working with still imagery, this focusing system works to acquire focus quickly and accurately, making it ideally suited to shooting and tracking moving subjects so that critical focus is attained with each shot. When shooting video, a movie servo AF mode offers smooth and natural focusing when changing from different subjects or different distances within the scene, as well as the ability to specify tracking sensitivity, AF speed, and face tracking priority. BenEFited by the touch AF system, rack focus is possible simply by touching elements within the scene on the touchscreen in order to change focus in an intuitive manner. Subject tracking in movies is also heightened due to the dual pixel CMOS AF system's ability to recognize subjects and maintain focus when working within changing or cluttered scenery.